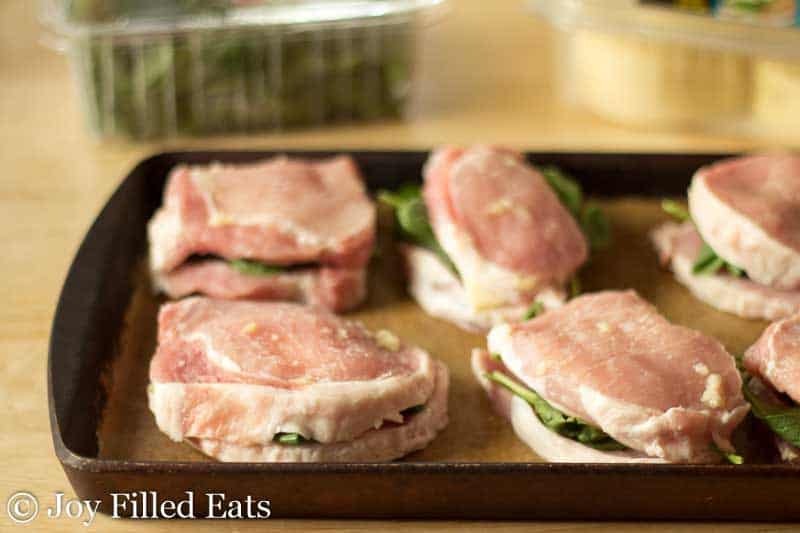 Stuffed pork chops with only 5 ingredients and a 5 minute prep time that taste delicious? You’ve come to the right place! 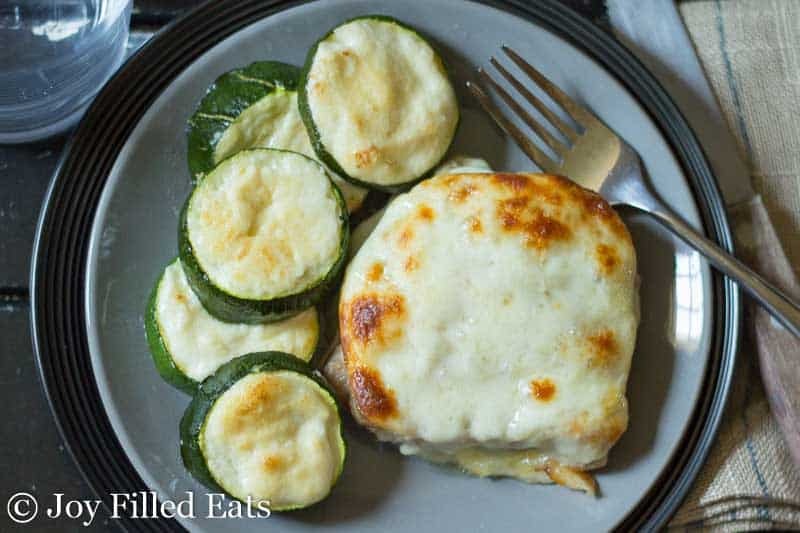 These garlic rubbed pork chops stuffed with spinach and provolone were a winner with my family. The trick to this recipe is buying thin cut boneless pork chops. You are really just stacking two pork chops on top of each other with the filling in the middle. But they seem like a fancy thick cut restaurant quality pork chop when they are done. If you can’t find thin cut pork chops you can slice regular boneless chops in half but it will add about 5 minutes on to the prep time. 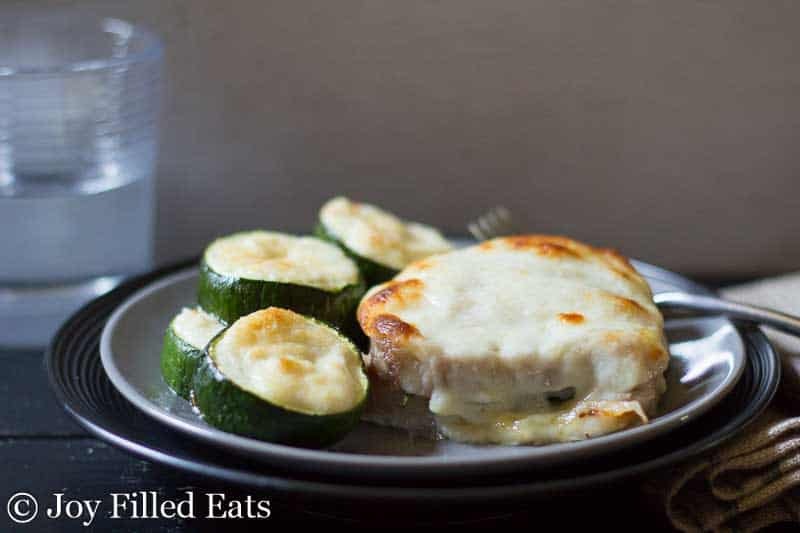 Stuffed pork chops with 5 ingredients & a 5-minute prep – Low Carb, Gluten Free, Grain Free, THM S.
I served this with my Garlic Parmesan Zucchini! This meal seems so rich and indulgent no one will ever know it is low carb ‘diet’ food. Stuffed pork chops with 5 ingredients & a 5 minute prep? Yes! 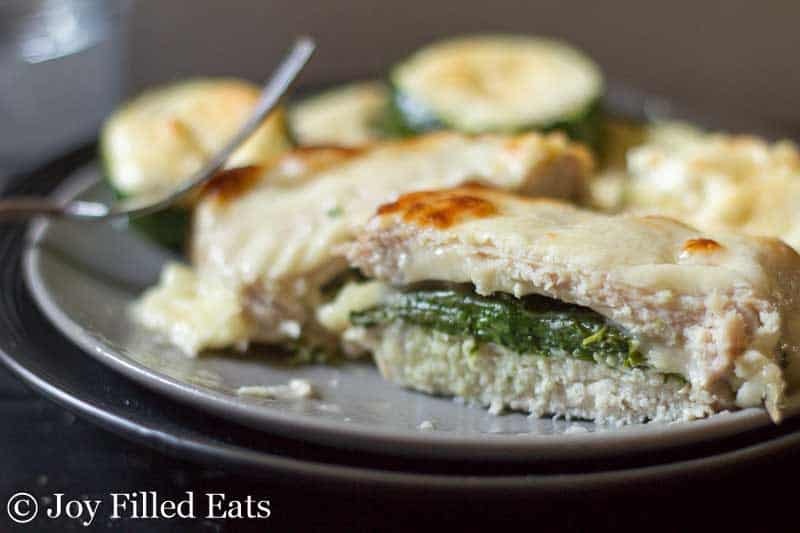 These garlic rubbed pork chops stuffed with spinach & provolone were a hit in my house. Press the garlic cloves through a garlic press into a small bowl. Add the salt and stir to combine. Spread the garlic rub on one side of the pork chops. Flip 6 chops garlic side down onto a large rimmed baking sheet. Divide the spinach between those 6 chops. 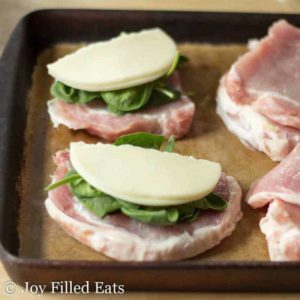 Fold the cheese slices in half and put them on top of the spinach. Put a second pork chop on top of each with the garlic side up. Bake for 20 minutes. Cover each pork chop with another slice of cheese. Back for an additional 10-15 minutes or until the meat is 160 degrees when checked with a meat thermometer. These are like having a gourmet dinner! My guests loved them! And SO easy. I will definitely make these again. Okay, LOVE these! So hearty and creamy and delicious. 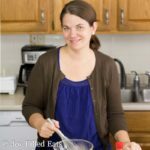 These are so perfect for a homestyle family dinner!